A peninsula with four seasons,that bridges two continents and which has been the home of the great cultures and civilizations of the world! The only city in the world located on two continents,Asia and Europe.Founded in 659B.c.it was the capital of the Eastern Roman (Byzantine) and Ottoman Empires since 330 A .D. Istanbul,the only city in the world built on two continents,has a strategic setting forming city's destiny as an imperial capital for nearly 1600 years,for Roman, Byzantine and Ottoman Empires.This metropolis proud of its rich history and unequalled natural beauty offers a friendly welcome and genuine hospitality. The ancient churches,synagogues, basilicas, the mosques,the mausoleums,the palaces,the bazaars and the baths are all standing today as the pride of all civilizations lived on her land.Today with her approximately 12 million population and ten universities and many institutions,Istanbul is also the most important center of Turkish science and culture. Istanbul's Grand Bazaar is a 540 year-old covered shopping mall of 64 streets,4.000 shops, 22 entrances and 25.000 workers.The bazaar consisted originally of two 15th century buildings with thick walls that were covered with a series of domes.In later centuries the streets around these buildings developed and were covered and new additions were made, turning it into a trading center.In the past each lane was reserved for a different profession and the handicrafts produced here were rigorously controlled. Topkapi is the largest and oldest palace in the world to survive to our day.In 1924 it was turned into a museum at Atatürk's request. Situated on the acropolis, the site of the first settlement in Istanbul,it commands an impressive view of the Golden Horn, the Bosphorus and the Sea of Marmara.The palace is a complex surrounded by 5 km of walls and occupies an area of 700,000 sqm at the tip of the historical peninsula. Following the conquest of the city in 1453,the young Sultan Mehmet moved the capital of the empire to Istanbul,His first palace was located in the middle of the town.The second palace,which he built in the 1470's,was initially called the New Palace,but in recent times it came to be known as the Topkapi Palace.Topkapi is a classical example of Turkish palace architecture. It consists of tree- shaded courtyards,each serving a different purpose and opening onto one another with monumental gates. The courtyards are surrounded by functional buildings.From the time of its construction,the palace developed constantly with alterations and additions made by each sultan. The Blue Mosque is one of the most famous monuments of Turkish and Islamic art,the mosque is visited by all who come to Istanbul and gains their admiration.This imperial mosque is an example of classical Turkish architecture,and it is the only mosque that was originally built with six minarets.It is surrounded by other important edifices of Istanbul,built at earlier ages.Istanbul is viewed best from the sea and the mosque is part of this magnificent scenery.Although it is popularly known as the Blue Mosque,its real name is Sultan Ahmet Mosque.Befitting his original profession,its architect Mehmet Aga decorated the interior fastidiously like a jeweler.Built between 1609-1616,the mosque used to be part of a large complex,including a covered bazaar,Turkish baths,public kitchens,a hospital, schools, a caravanserai,and the mausoleum of Sultan Ahmet.Some of these social and cultural buildings have not survived to our day. 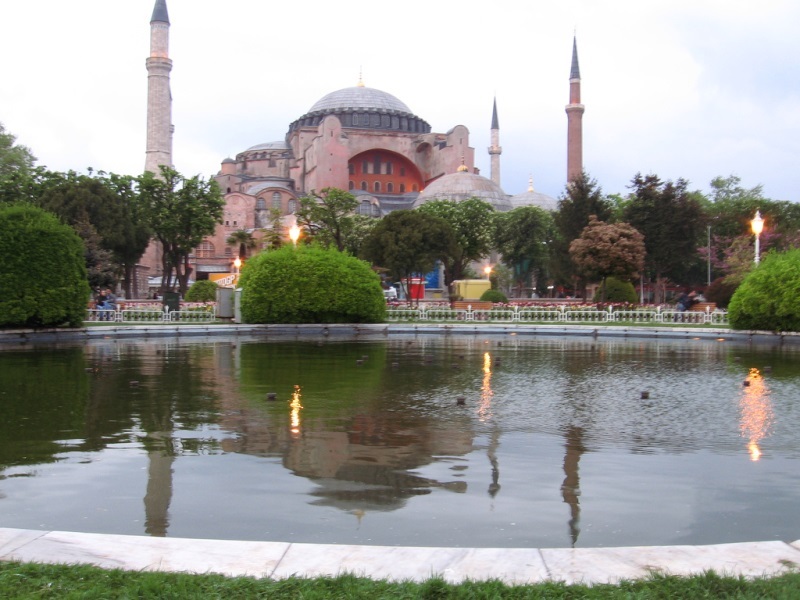 Hagia Sophia,which is considered as one of the eight wonders of the world,also occupies a prominent place in the history of art and architecture.It is one of the rare works of this size and age that has survived to our day. The Million Stone located in Istanbul has been known as the “center of the world” during the Byzantine Empire.A thousand years later, Istanbul is still being accepted as the heart of Eurasia conjoining the two oldest continents. The Dolmabahce Palace,a blend of various European architectural styles,was built between 1843-1856 by Karabet Balyan,the court architect of Sultan Abdulmecid.The Ottoman sultans had many palaces in all ages, but the Topkapi was the official residence until the completion of the Dolmabahce Palace.The three-storied palace built on a symmetrical plan has 285 rooms and 43 halls.There is a 600 m long quay along the sea and two monumental gates,one of them very ornate,on the land side. Well-kept, beautiful gardens surround this seaside palace.In the middle, there is a large ballroom with a ceiling higher than the other sections.The entrance section of the palace was used for the receptions and meetings of the sultan,and the wing behind the ballroom used as the harem section. The Spice Bazaar,the second largest covered market in the city,was part of the mosque complex. Other surviving parts of the complex are the tombs and the magnificent fountain.On the mosque side of the L-shaped Spice Bazaar,there is a popular flower market and cafes,and fish,vegetable and grocery stores occupy the other side.Once all of the shops inside the bazaar used to sell spices, but over the time some have turned into dried fruit,grocery and gift shops or jewelers.It is one of the attractive sites in Istanbul with its vivacious and distinctive atmosphere. The Galata Tower offers the best view of the Golden Horn,Old Istanbul, the entrance to the Bosphorus and the Asian shore.The tower was erected to observe the port and the city,and after being used for various purposes over the centuries,it has now reassumed its original function of watch tower - this time to enjoy the view. An elevator takes the visitors to the top two floors of the tower that are today occupied by a restaurant and a nightclub.Nights are colorful here with belly dancers,folk dance groups and singers performing in a typical atmosphere and against the marvelous view in the background. The Leander's Tower is was built on an islet at the entrance to the Bosphorus.This small and attractive tower is one of the symbols of Istanbul.Used in the past as a watchtower and a lighthouse, it has been preserved in its 19th Century appearance.It serves as a landmark for ships entering the Bosphorus and will be used for touristic purposes.